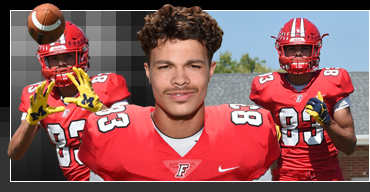 A three-year varsity starter in football, Fairfield tight end Erick All has been one of the area's most sought-after recruits. He is rated as the top tight end in Ohio's '19 class by 247sports.com. His junior year, Erick had 30 receptions for 361 yards and 4 TDs. He also played wide receiver, punted and was a punt returner for the Indians. He was named first-team all-Greater Miami Conference, 2nd team all-city (Enquirer) and second-team all-district. Erick had a busy off-season leading up to his senior campaign. He attended the Under Armour All-American Camp In Cleveland earlier this year and this past summer, he was named MVP of the FBU Top Gun Camp in Rock Hill, South Carolina. Erick, who is active in community service, also played varsity baseball as a sophomore for the Indians. He will continue his football play at the next level, having committed to the University of Michigan. His favorite athlete is Julio Jones, favorite entertainer is Aries Spears, favorite book is Night by Elie Wiesel, favorite movies are Men of Honor and Matchstick Men, and most-like-to-meet is Rhianna. COACH'S QUOTE – "Erick has developed into one of the best I will ever coach. His combination of size, strength, athleticism and tenacity are the reason why."